NATIONAL REPORT -- Four more convenience store retailers -- 7-Eleven Inc., Rutter's Farm Stores, Hy-Vee Inc. and United Supermarkets LLC -- joined the boycott against Rolling Stone Magazine's latest issue, which features a cover image of the alleged Boston Marathon bomber, Dzhokhar Tsarnaev. The c-store retailers issued separate statements today explaining their decision to ban the Aug. 1 issue, which hits newsstands Friday. "7-Eleven Inc.'s position is to NOT sell the Aug. 1 issue of Rolling Stone," company spokeswoman Margaret Chabris stated to FOX4 News in Kansas City. Chabris told the news outlet that the convenience store chain will not sell the upcoming edition in its approximately 1,700 company-operated outlets around the nation. 7-Eleven is also strongly recommending its 5,900 franchised stores choose not to sell the issue. York, Pa.-based Rutter's Farm Stores took to its Facebook page to announce its decision. "We will be pulling the recent issue of Rolling Stone with the alleged Boston bomber from our magazine racks out of respect for the victims of the attack and their loved ones," the company wrote. Rutter's Farm Stores operates 57 convenience stores in central Pennsylvania. Yesterday, grocery and c-store operator Hy-Vee Inc. also wrote the following statement on its Facebook wall: "Hy-Vee has received many questions and complaints from customers regarding the current issue of Rolling Stone Magazine, which features a cover photo of the Boston Marathon bombing suspect. In general, the decision whether or not to carry a particular publication rests with each individual store; however, in response to feedback from our customers, we have asked all our stores to refrain from displaying or selling the issue of Rolling Stone in question." As of December, there were 110 Hy-Vee convenience stores across eight Midwest states. The company is headquartered in West Des Moines, Iowa. Taylor noted that Rolling Stone is only available at a limited number of the company's United Supermarkets, Market Street, Amigos and United Express locations. These latest retailers join two New England-based chains, Tedeschi Food Shops Inc. and Cumberland Farms, who both announced via social media yesterday that they will ban the latest Rolling Stone issue. In a televised interview yesterday, Tedeschi Food Shops' CEO Peter Tedeschi spoke to Fox News' Eric Bolling and called the Rolling Stone cover "grossly inappropriate." "Now, in all fairness, we sell them [copies of Rolling Stone] in 60 of our 200 stores, but that's not the point," said Tedeschi. "One of our stores is actually located between the two blast sites. So, we have employees that were fortunately not hurt but certainly affected, and we have a lot of customers who will carry scars with them for a long time. Some would argue that this is really about censorship. Not at all. This is about fellowship. And it's about fellowship with the first responders and fellowship with all those affected by this tragic event." Companies across the retail industry -- some with strong New England roots -- have also decided to boycott the issue. As of press time, they include CVS, Rite Aid, Walgreens, Duane Reade, Kmart, Stop & Shop, Big Y, Shaw's, Roche Bros. and Hannaford. As CSNews Online previously reported, a majority of Facebook subscribers lauded the c-store operators' decisions yesterday, while some criticized it as a knee-jerk reaction, one made without reading the full article. The incidents surrounding the April 15 Boston Marathon bombing left four dead and 264 injured. The 19-year-old Tsarnaev has accused his older brother, Tamerlan Tsarnaev, of being the mastermind behind the plot. The elder Tsarnaev was killed in a shootout with police on April 19. When it comes to c-store shopper research, Convenience Store News' Realities of the Aisle is in a class by itself. . The 2013 Convenience Store News Industry Forecast Study projects a fairly optimistic view of business conditions for convenience store retailers this year despite the nation’s fiscal problems..
A new crop of next-generation technology, including social media analysis, mobile payments and mobile applications (apps), is getting retailer attention, according to the Convenience Store News’ exclusive 2012 Technology Study..
Nearly two-thirds of convenience store operators expect to see their foodservice sales increase this year compared to 2011, according to Convenience Store News’ exclusive 2012 Foodservice Study.. The convenience store industry achieved several new sales peaks last year, but rising operations costs and continued volume declines in fuel and cigarettes made the climb difficult.. When it comes to c-store consumer research, CSNews’ 2012 Realities of the Aisle is in a class by itself.. 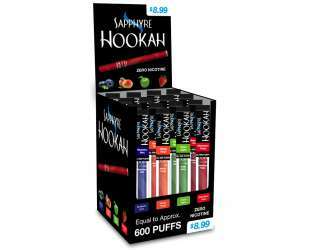 Designed to capitalize on the hottest trend – and one of the fastest growing segments – in the e-cigarette market space, Sapphyre Hookah is an exciting new line of flavored electronic hookah from ECO-CIGS. © 2013 Stagnito Media. All rights reserved.